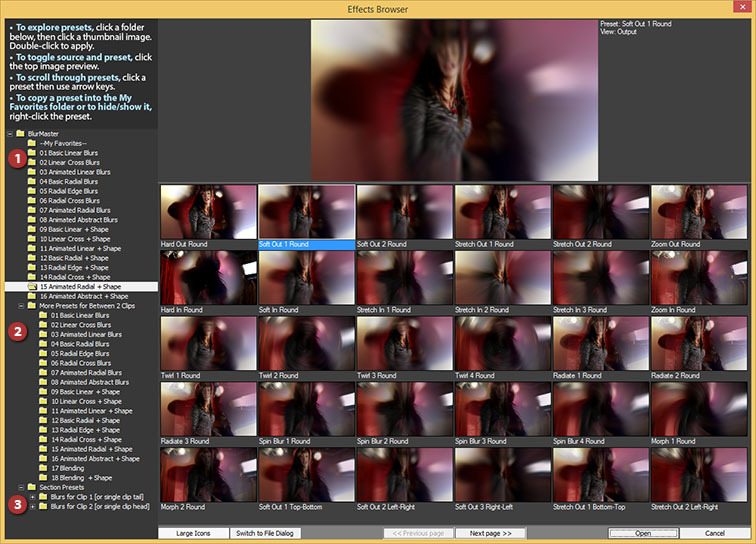 BlurMaster is a video transitions plugin for Windows, including Windows 10. Sorry, we have no Mac versions currently, but may soon! 1. Overlap two events in the SAME video track of your Vegas timeline, automatically creating a crossfade transition. 2. Drag BlurMaster (the name, or a Vegas preset for it) from the Vegas Transitions list onto the crossfade. Or right-click the crossfade and choose Transition Properties, then double-click BlurMaster. The BlurMaster interface will then appear. Instantly load a pre-made effect from nearly 750 cool presets (plus your saved favorites) via a large animated Effects Browser window. Or Alt-click for a standard Open dialog. (1) Use the Blur Clip 1/2 sections of the plugin to adjust main blur settings. To quickly try pre-made settings, click the Section Presets button -- a Pixelan exclusive! (2) If needed, untwirl other sections of the BlurMaster plugin to fine-tune further. Add blends, mix in a subtle iris or linear shape to influence the transition’s progression. (3) In Vegas, set the transitions’s progress the usual way: right-click BlurMaster in the timeline; then select Insert/Remove Envelope > Transition Progress. Then right-click the purple envelope line as needed. Done! (A) Help. Click the ? button to access help. (B) Save Preset. Click the disk to save a favorite effect to later choose it instantly in Vegas. Or click the Save to Effects Browser button to apply it later from our visual Effects Browser window. (C) Load Section Preset. Click to instantly change only the section’s controls via handy ‘section’ presets. Easily explore hundreds of new effect variations! (E) Keyframing. Use Vegas‘ keyframing to vary a visual quality over time. NOTE: You not need to keyframe the blur strength from/to 0%, unless you want to modify the blur progress. Choose from over 750 pre-made professional effects in BlurMaster. There are THREE ways to access presets -- Effect Browser presets, Vegas presets, and Section presets. This is the most powerful and visual way to access presets and is where HUNDREDS of transition presets are located. Click the Click here to load a preset... button at the top of BlurMaster (as shown by the smiley in the above illustration) to open a wonderful large Effects Browser window to visually choose/compare from over 750 pre-made presets (including those you have made and saved for future re-use). (1) Main presets use the same blur for clip 1 and 2 and are equally good for either transition between two clips or for a single clip head/tail use. (2) Presets in "More Presets for Between 2 Clips" folder use different blurs for clip 1 and 2 or some features not available with a single clip and will look complete only when applied between two clips. (3) The "Section Presets" folder contains over 200 pre-made blur presets for Clip1 ONLY and Clip 2 ONLY. These presets change ONLY controls in ONE Blur section of BlurMaster. Use presets in this folder to quickly and easily combine different blurs for clip 1/2 and make hundreds of new blur transitions. The Effects Browser is shown below. To save your own custom presets in the Effects Browser, use BlurMaster controls to set up the desired look, then click the Save button in the main BlurMaster control area. The Effects Browser is fast, but sometimes you may already know which preset you want to use, such as when you are applying the same preset repeatedly in a project. In that situation, selecting a preset by one of the following methods can be faster...To see recently chosen Effects Browser presets, Ctrl-click the Load a Pre-made Effect button. For a multi-level menu of Effects Browser presets, Shift-click the Load a Pre-made Effect button. To use a standard Open file dialog box, Alt-click the Load a Pre-made Effect button. • To scroll through presets in a folder while keeping your eye on the top preview image for comparison, hold the mouse pointer over the right panel then use arrow keys or the mouse wheel. • To increase/decrease the thumbnail image size, use the Size button at the bottom of the Effects Browser. • To copy a favorite preset into the My Favorites folder located atop the left column of preset folders, right-click any preset image and choose Copy to My Favorites. To copy the preset into a subfolder within that folder (such as if you want to organize presets per project or per client), right-click the preset and choose Copy to My Favorites >> [new subfolder]. You can then name the subfolder as desired. After the subfolder is created, it will also appear in the right-click menu. • To rename a preset that is in the My Favorites folder, right-click the preset there and choose Rename this preset. To remove a My Favorites preset, right-click and choose Delete this preset. • To hide any preset, right-click the preset and choose Hide this preset. To show all hidden presets in a folder, right-click any preset in that folder and choose Restore all hidden presets from this folder. To temporarily view the folder's hidden presets, which can be handy if you just want to momentarily browse them, choose Temporarily show hidden presets. • To toggle between viewing the source file image and the BlurMaster preset, click the top large preview image in the Effects Browser. If you prefer, you can save favorite Effects Browser presets and/or custom presets in Vegas's usual place, although using our Effects Browser is much more visual and easier to compare choices. The one advantage of the usual Vegas way is you can apply a favorite preset quickly without entering the BlurMaster interface at all. Unlike the Effect Browser presets or Vegas presets, these change ONLY the controls in ONE section of BlurMaster. Mixing presets from several sections is a quick and easy way to try hundreds of fresh transition variations. 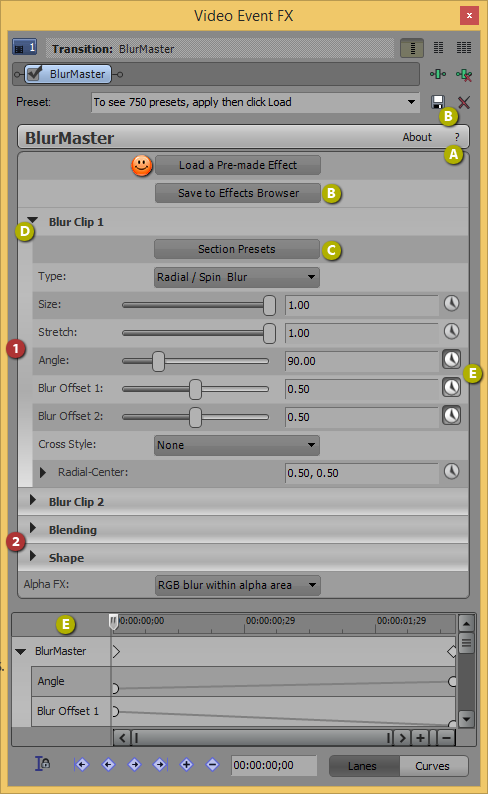 For example, try different Blur presets for Clip 1 and Clip 2 without affecting what you have set up in the other controls of BlurMaster. NOTE: In Blur sections you can make even a two-step adjusments. Select the "main" Blur settings from some submenu with a prefix "Step 1" and then try the offset presets in "Step 2 - Add Offset" submenu. To choose a section preset visually instead of from a list, Shift-click the button. Adjust the main BlurBlender controls. Choose a section preset at right for common settings. NOTE: When applying BlurMaster onto a single non-overlapped clip only one Blur section is active. When applied on HEAD only Blur Clip 2 is active, when appliead on TAIL - only Blur Clip 1 is active. Blur Type. Choose the Blur type. To turn a standard blur into a linear blur, use the Stretch slider below. To turn a radial blur into a spin or spiral blur, use the Stretch and Angle sliders below. Size. Sets the maximum blur strength. To create extreme blurs, manually enter a value greater than 100. NOTE: BlurBlender automatically varies the blur strength so that the transitions always start/end with a crisp image. You not need to keyframe the blur strength from/to 0%, unless you want to modify the blur progress. Stretch. To stretch a blur into a linear, spin, or radial blur, adjust towards 0% or 100%. Angle. Set the direction of a linear, spiral, or offset blur. Blur Offset. For linear blurs, the Offset controls can create wind trailing effects. For radial blurs, rays and various spin and zoom effects can be created. See the section presets in "Step 2 - Add Offset" submenu for examples. NOTE: If the Stretch control above have value of 0% or 100% only one of the Offset directions will be active. Cross Style Cross blurs are available to blur in two perpendicular directions and blend the results, creating various crosshatch textures. For this effect, set the Stretch slider towards 50%. Radial Blur X/Y. Position the radial blur center point. Optionally use Photoshop-like blend modes and glows in this section to create new looks. NOTE: When applying BlurMaster onto a single non-overlapped clip, some blending modes can produce irregular visual results. In this case, set the Blending slider to 0%. Tip: You still can use modes like Lighten and Darken to alter the transition brightness, experiment with Blending values outside the 0-100% range and use Glow conrols. Blend Mode. To fine-tune the blur, choose a Photoshop-like blend mode. To see these blends, make sure that the Blending control below is not 0. Blending. Set the opacity of the blend mode above. 100% is pure blending, for unusual looks, enter values outside the 0-100% range. Glow. Optionally add a glow to enhance the effect. Glow Size. Increase to spread the glow further into darker areas. Glow Color. Select the glow color using the eyedropper or color controls. Glow Mode. Set how the glow mixes into the images. "Add" tends to brighten or tint towards the chosen glow color. "Overlay" replaces the image with the chosen color. Use this section to conform the blur to a shape. Choose a section preset at right for common settings. Shape. Choose a shape from several geometries. Strength. Set how strongly the blur conforms to the chosen shape. X/Y Position. Position the shape within the image by dragging the center point. If "Linear" is selected, you can adjust its angle by moving the center point. For more precision, enter numerical values. Text/Alpha FX For titles and source clips with an alpha channel, this sets the alpha channel processing. "RGB blur" affects only RGB channels. "RGB blur within alpha" retains sharp frame edges in clips that are smaller than the project's frame size. "RGBA blur" variations are handy for text blur since the alpha channel is also blurred.